The 2018 WIAA football playoffs begin on Friday and Saturday with Level 1 games across Wisconsin. Eight games each in seven divisions will be played this weekend with aspirations of a trip to Madison in November on the line. All four local teams – Marshfield, Spencer/Columbus Catholic, Auburndale and Stratford – qualified for this year’s playoffs, and all will play games at 7 p.m. Friday. When and where: Friday, Oct. 19, 7 p.m., at Beell Stadium, Marshfield. About the Jaguars: Ashwaubenon won its final two games, 46-27 against Sheboygan North and 35-0 against Sheboygan South, to qualify for the postseason. Jaguars quarterback Cadian Vang has thrown for 924 yards and 11 touchdowns and Jon Maldonado is their leading rusher. Ashwaunbeon has scored more than three touchdowns in a game only three times this season. About the Tigers: Marshfield completed its first undefeated regular season since 1999 in a capturing its second-straight VFA West title. The Tigers have allowed just 98 points this year and won each of their final four games by 30 points or more. Senior quarterback Ryan Krueger threw for 1,181 yards and 15 touchdowns, and was Marshfield’s third-leading rusher with 351 yards and three scores. Senior running back Brant Bohman tops the Tigers’ rushing attack, running for 728 yards and 13 scores. When and where: Friday, Oct. 19, 7 p.m., at Ted Fritsch Field, Spencer High School. About the Raiders: Arcadia won its final two games, 32-7 over Black River Falls and 40-6 against Onalaska Luther, to earn a playoff berth. The Raiders have a balanced offense, with three quarterbacks throwing passes this season for a combined 879 yards and 11 touchdowns, and four different ball carries rushing for between 168 and 384 yards. Receiving Michael Schweistal is the main offensive threat, catching 37 passes for 529 yards and seven scores. About the Rockets:: Spencer/Columbus won seven games in a row to start the season before a 23-6 loss to Eau Claire Regis in Week 8. The Rockets responded with a 49-20 trouncing of Altoona in their regular-season finale last week, and have outscored their opponents 322-101 this season. SC has used multiple big plays to bust open a number of its games early as senior quarterback Jarred Mandel has thrown for 1,269 yards and 17 touchdowns, and both Austin Bacon and Carson Hildebrandt have more than 500 yards rushing and 10 touchdowns each. Bacon has also been the team’s top receiving, hauling in 26 catches for 486 yards and nine more scores. When and where: Friday, Oct. 19, 7 p.m., at Tiger Stadium, Stratford. About the Eagles: Northland Pines won two of its final three games, including a 28-16 win over Three Lakes/Phelps last week, to secure a playoff spot. The Eagles like to run the ball as six different ball carriers have at least 100 yards rushing this season, led by Ryan Peterson’s 703 yards and 11 touchdowns. Pines has only passed for a little more than 300 yards in nine games. About the Tigers: Stratford is coming off a heart-wrenching loss to rival Edgar in the final seconds last week, which snapped a seven-game winning streak. Kade Ehrike has been the workhorse for a powerful Stratford offense that is averaging 411 yards per game. Ehirke has rushed for 1,195 yards and 21 touchdowns, while three others – Derek Marten, Chase Flink and Matt Handrick – all have more than 200 yards on the ground as well. Quarterback Max Schwabe has completed 63 percent of his passes for 1,145 yards and 11 scores. When and where: Friday, Oct. 19, 7 p.m., at Manawa Little Wolf High School. About the Apaches: After a slow start and tough schedule in the first half of the season, the Apaches won four of their final five games – three by shutout – to slip into the WIAA playoffs. Auburndale completed a 3-3 Marawood slate with a 47-0 shutout of Chequamegon on Oct. 5 and followed that up with a 42-0 nonconference win at Whitehall on Oct. 12. Auburndale played a nonconference game at Manawa on Aug. 24, losing 34-22 as the Wolves outscored the Apaches 31-14 in the second half. 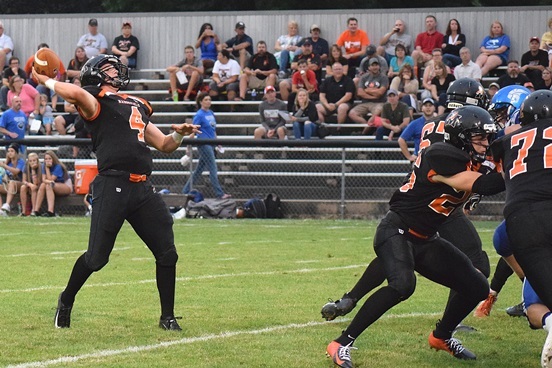 Trayton Weister has rushed for 887 yards and 10 touchdowns, and Isaiah Hasenohrl is coming off a 312-yard, five-touchdown rushing performance in last week’s win, spelling Weister, who did not play. About the Wolves: Quarterback Mason Wiesener had 197 yards rushing and two touchdowns in the early-season win over Auburndale, and also kicked a pair of 35-yard field goals. Wiesner has ran for 839 yards and 12 touchdowns, and thrown for 1,234 yards and 14 TDs this season. Running back Seth Forbes has a team-high 941 rushing yards and 11 touchdowns, for a powerful Manawa offense that has scored 45 points or more in five of its six wins. Paul Lecker is publisher of MarshfieldAreaSports.com and a contibutor to focusonmarshfield.com.